Man City 15 games from the quadruple - can they do it? What's more, they are the bookies' favourite to win every competition. So can they do it? The most competitive title race in years? Two years later, Sir Alex Ferguson's Manchester United side made it to 19 April before their dream ended with a penalty shootout defeat by Everton in the FA Cup semi-finals. The best haul in United's history famously saw them win the Treble in 1998-99 but they were nowhere near the quadruple that season, losing to Tottenham in the quarter-finals of the League Cup on 2 December. Another legendary Premier League side, Arsenal's 'Invincibles' of 2003-04, might have stayed unbeaten for the duration of their league campaign but their quadruple hopes ended on 3 February when they lost 3-1 on aggregate to Middlesbrough in the League Cup semi-finals. Manchester City's 'Centurions', who broke a series of Premier League points and scoring records on their way to last season's title, were fighting on four fronts until 19 February before losing to Wigan in the FA Cup. But City's best effort before this year actually came in 2013-14, when Manuel Pellegrini's side lost in the FA Cup quarter-finals on 9 March - again going out to Wigan, so it is probably a relief they do not have to face the Latics this season. Before the Premier League and Champions League era began in 1992, Brian Clough's Nottingham Forest went closest in 1978-79 when they got to 26 February before losing to Arsenal in the FA Cup fifth round. While runners-up were allowed to compete in the Champions League from 1997-98, only the league champions or the holders entered the European Cup, limiting quadruple opportunities - as did the ban excluding English clubs from Europe between 1985 and 1990. Liverpool's all-conquering side of the late 1970s and early 1980s had nine successive seasons in the European Cup between 1976-77 and 1984-85, and completed a Treble of league, European Cup and League Cup in 1983-84. But they went out of the FA Cup in the fourth round that year, on 29 January - which means that, in terms of games, they were five matches short. Of course, there have also been teams who have challenged for pretty much everything and ended with nothing. Leeds went out of the League Cup in the third round in 1969-70 but went close in the league, FA Cup and European Cup - before finishing second and losing in the final and the semi-final. Pep Guardiola won six trophies in the calendar year of 2009 with Barcelona - the Champions League, La Liga, Spanish Cup, Fifa Club World Cup, Uefa Super Cup and the Copa del Rey. But he failed to win the 'proper' quadruple during his best season with Barcelona in 2009-10. They picked up the Spanish Cup and La Liga - showing Barcelona's dominance in Spain - but fell short in the semi-finals of the Champions League. Interestingly, Paris St-Germain won all the silverware in France in 2014-15, 2015-16 and 2017-18 - picking up the Trophee des Champions, Ligue 1, Coupe de France and the Coupe de la Ligue. Ex-Chelsea striker Chris Sutton told BBC Radio 5 Live: "You can't say the draws have been rigged but they have had an unbelievable run in the Champions League, the League Cup and the FA Cup. They have hardly played a decent side, with respect." Domestically, the view that City have got lucky appears to stack up - on their way to winning the Carabao Cup they won against a much-changed Leicester, who beat them in the league less than two weeks later, but the only team they met from the top half of the Premier League was Chelsea in the final. In comparison, Chelsea had to get past Liverpool - albeit a shadow Reds side that had rested most of their big names - and Tottenham on their way to Wembley. City's FA Cup draw has been even kinder, featuring only one top-flight opponent so far. 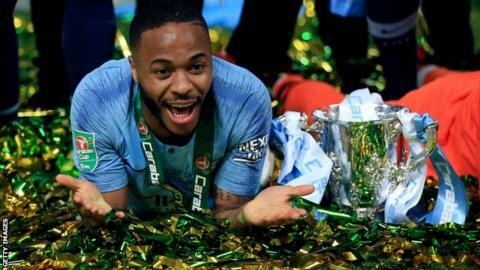 But that has undoubtedly been helped by the attitude of many Premier League clubs, including title rivals Liverpool as a prime example, not to prioritise the tournament. But while there has been an element of fortune in who City have played - or avoided - in the domestic cups, it has played a much smaller role in deciding who they have met so far in Europe: Lyon, Shakhtar Donetsk, Hoffenheim and Schalke. Former Arsenal striker Ian Wright told BBC Radio 5 Live: "If you were City and you were able to pick your way through a cup competition, you would probably have picked that!" Even so, City were not handed the best draw on paper of any of the top seeds - their opponents in Group F might have lacked glamour but they still had an average Uefa co-efficient ranking of 46 based on their results in European football over the past five seasons. Using the same criteria as Uefa, three of the eight top seeds - PSG, Bayern Munich and Barca - had easier draws than City. Ajax were the weakest team left in the last 16 on paper, but just ask Real Madrid how that "easy" draw turned out. Guardiola's side have relied on their squad depth this season - using 30 players in total, only three fewer than Arsenal, who have used the most out of the other Premier League teams. Defender Kyle Walker has played the most minutes (3,288) by an outfield player for City, while four others - Aymeric Laporte, Bernardo Silva, Raheem Sterling and Fernandinho have also clocked over 3,000 minutes each. But there's been no sign of City slowing down. They have scored 142 goals already and average 2.9 per game. City midfielder Kevin de Bruyne said it would be "nearly impossible" to win the quadruple, while Guardiola said it was "incredible" that City are even fighting for all four titles. They will need some good fortune if they are going to do it, but an element of "top-team luck" seems to be on their side already - they were fortunate to receive a contentious penalty and an apparent offside goal against Swansea in their FA Cup quarter-final victory. "I just don't think it will be that easy for Manchester City to play a good Premier League team three times in a short space of time," former Republic of Ireland captain Andy Townsend told BBC Radio 5 Live. "Even though the first one against Spurs is a Champions League tie, it is massive for the bigger picture if Spurs can turn City over. Knowing there are two more games against Tottenham before going to Manchester United is a tough, tough spell to go through." City won't want to meet Barcelona in the final either. They have lost five of their past six meetings, scoring just five goals and conceding 12. City have also failed to win a game in Madrid - the venue for the final. If Liverpool get there, they will fancy themselves to beat City. Klopp's side were the ones to knock them out in last season's quarter-finals and have lost only once in their past five meetings. "I think Manchester City will win the Champions League and the FA Cup but I can see Liverpool winning the Premier League," he said. "What City are trying to achieve, what they did last season and what they are doing this year, is unbelievable." One thing is for certain - if City win their next 15 games, they will achieve a quite remarkable feat.